Yesterday, I read a fascinating article at NPR. There is a new study suggests that organic farms grew tomatoes that were 40% smaller (than conventional), BUT were actually significantly higher in vitamin C, sugar and lycopene. Their reasoning is because organically farmed tomatoes are “stressed-out” more than conventional due to less pesticides. The organic plants are forced to fight off pests naturally; the additional stress equates to additional production of stress-fighting compounds like Vitamin C and Lycopene. Yes, we need to further investigate this study’s conclusion, but when I was researching tomato hornworms and cabbage worms last summer, many experienced gardeners advised that it was better for the plants to have a few pests because it made them stronger. It does make sense when you really think about it, doesn’t it? The extra bonus is there’s so much more to a tomato than vitamin C & lycopene, so just think of all the tiny un-known micronutrients that are bursting from a responsibly-farmed tomato. Can’t get that from a lab-created vitamin! Yeah, sometimes eating organic gives you a surprise or two. This afternoon, I was cutting off bits of the farmers market celeriac and plop, out fell a small (dead) worm. SURPRISE! GASP! EEK! I tossed it in the trash, but then I also noticed another teenie one on the counter that was slightly wiggling. Tossed that one too. So, what’s more gross? A couple of occasional worms or pesticides? I’ll take the bugs thank you! Finding them always make me gasp and flutter, but it’s worth it when you know exactly where your food is coming from. Hey and bugs have to eat too, right? Having a garden really opens your eyes to how produce naturally grows, and it’s a lot different than what’s found at the store. Grocery stores offer “vine-ripened” tomatoes, but as I recently learned, even those are not truly ripened while attached to the tomato plant. The branch is cut, but the tomatoes are still attached to the “vine” so they can market them as such. They are then ripened by ethylene gas, as it travels across country. 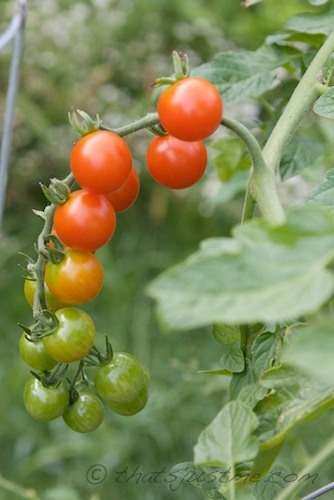 As my tomatoes are growing and ripening, I’ve noticed that the fruit that is closest to the main branch will ripen first, then ripen outward toward the end of the row. This morning, as I was harvesting my tomatoes, I got to thinking about the perfectly-colored-red ripened tomatoes on the vine at the grocery stores (like the “grape” variety) and how unnatural it is to have the whole vine ripened at the same time. At least that’s not how it happens in my natural backyard garden! We were in the garden Sunday morning, and while I was glancing at my in-ground tomato plants, I noticed what looked like white spikey roots growing out of a tomato leaf. Mind you, my eyesight is not great, but I immediately thought about how weeks before, I noticed low branches were beginning to develop roots where they were touching the ground. I took a closer look, and yuck! I was mortified to see a big fat icky green worm with rice-like eggs on it’s back. I wasn’t wearing my garden gloves, so I called DH to come and grab it off. Luckily, he broke off the whole leaf (more on that later) and kept the bugger intact. I was fascinated by this little pest, so I took it into our workroom, grabbed the camera and took some photos. Then I googled, and learned that we had a Tobacco Hornworm (with a menacing-looking horn on its back-end, that actually isn’t menacing or harmful at all!) and those weren’t eggs on its back. They are Braconid Wasp larvae cocoons. The more I learned, the more grossed out but fascinated I became. It’s literally the movie “Alien” come to life! 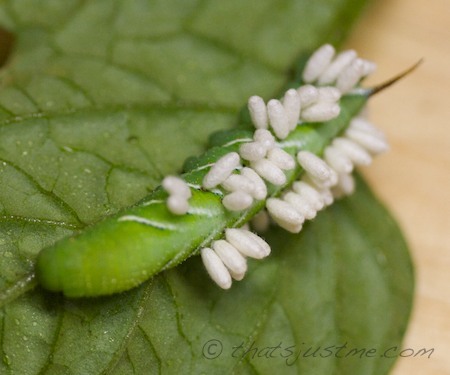 What happens is the female braconid wasp lays eggs under the skin of the hornworm, and the baby larvae feed on the worm, as he sits, paralyzed on a leaf. They eat their way out of the layer of skin and spin themselves into a cocoon, where they continue to eat their “host” until they eventually emerge from their cocoons as adult braconid wasps. I have had the worst case of heebie jeebies all day thinking about it, especially after seeing all the youtube videos and photos. Yuck. Just thinking about the wasps eggs hatching inside a living host and popping out is enough to give me nightmares! But I was a good doobie, and I put the hornworm, complete with leaf, back over near our tomatoes. I’m hoping that all the wasps will hatch and feast on any hornworm pest population left in my garden. Nature is wonderful, isn’t it? And I have discovered so much about nature in just a few short months, it’s amazing and thrilling! It also makes me sad because so many home gardeners don’t think twice about using toxic pesticides instead of allowing Mother Nature a chance to handle it herself! UPDATE 2012-08-19 ~ This morning, I noticed TWO more icky hornworms covered with the Braconid wasp cocoons, and I let them be on the plant. Exciting. I hope the wasps hatch and attack any future hornworms on my tomato plants. I was perusing the new Fearless Flyer from Trader Joe’s and saw their jarred roasted red peppers were being showcased. I normally try to buy organic peppers (unless it’s from a local farm), since peppers are on the Dirty Dozen list of conventionally grown produce to avoid. I’ve seen these jarred roasted red peppers at the local Trader Joe’s stores, and while the cheap $1.99 price tag was very tempting, I’ve always resisted. Their Fearless Flyer description “They’re grown in Peru, where the strength of the sun’s rays gives these peppers a brilliant red hue” — wow, they make it sound so good, right? I can picture a quiet field of peppers quietly growing in the Peruvian sun. I googled Pesticides on Produce from Peru and found that there is a scary amount of imported produce contaminated with illegal pesticides. Peru is on the list to avoid, along with, of course, China and Mexico, and other countries like Guatemala, Dominican Republic, and India. Now I’m glad I’ve resisted, and I will continue to buy jarred organic roasted red peppers instead, or better yet, I should try making my own and freeze. Sorry Trader Joe’s. So, I think I’m just about done with planting. Yay! I still have a few plants leftover, but for the most part, the majority are planted, either in containers or in the ground. I feel very accomplished! Onto the next issue! Pests! Worms/caterpillars have been eating my rhubarb, blackberry and strawberry leaves like crazy! I don’t recall there being this big of a problem in past seasons, but maybe I’m just more observant this year. I heard BT (Bacillus Thuringiensis) is a good pesticide that is approved for organic gardens. It is a naturally-occurring bacteria that targets specific worms/caterpillars and doesn’t harm other beneficial bugs or critters. Right now, I’m picking off wormies by hand, which is so gross, but so far, I can handle it. I read that if you let the plant develop its own defenses, it’s a much stronger plant, so I’ve not applied any pesticides yet. I noticed that the strawberries are indeed growing more leaves to make up for the leaf loss. It makes sense, because in the wild, berries must fend for themselves, and they do alright. Unfortunately though, there is one section of strawberries that are looking a bit small and anemic, but the others are healthy. The blackberries seem to be normal, although they are just at the flowering stage right now, but the leaves do not have that much damage. The rhubarb is having issues, but I think it’s due to having too little sun. Now, a bigger problem will be my veggie garden. I already noticed a big ugly green worm crawling on the dirt yesterday, (probably trying to find its next meal,) and one more on a cabbage leaf this morning. DH’s poor watermelon plant looks like it’s been eaten pretty badly too. So, yes, I’m thinking BT might be the answer for my vegetables. So far, the plants in containers are doing well, no sign of any leaf eaters! I’ll be posting photos soon of the garden. It was a glorious weekend for weather. I can’t believe how hot it’s been and it isn’t even June yet. I’m hoping the heat keeps up so cucumbers, peppers, eggplant and tomatoes will flourish! Very soon, my peas will be popping! I’m looking forward to pinching a few tendrils for my salad or soup! YUM! Life is good here at my little farm! ha! I LOVE Chocolate! But There is a Dark Side! I love dark chocolate, and it’s so good for you, as long as you’re eating 70% and higher! But there is a secretive dark side to chocolate (no pun intended) and it’s hidden in the form of cheap, overly-available cocoa! Cocoa products are in high demand, but the cocoa “market” demands low prices. To remain competitive and cut costs, many cocoa farmers force young children into slavery, pushing them to work endless hours on their farms, where they live in brutal conditions. They are exposed to toxic pesticides & fertilizers, dangerous tools like machetes, and countless beatings when they are too slow or try to escape. This unspeakable abuse happens in Western Africa, where children from nearby countries are lured away from home with false promises and transported to farms in Côte d’Ivoire (also called the Ivory Coast) and Ghana. These two countries supply 75% of the world’s cocoa supply, selling to the main chocolate companies, Hershey, Nestle, Mars, and Kraft. Over the last few months, I’ve transitioned to purchasing local humanely-raised animal products. To balance the extra cost, I eat less of them. How could I be so concerned about animal welfare, but turn a blind eye to humans being treated so poorly for a block of cheap chocolate? In the same way, chocolate should be thought of as it was in the past, like a luxury; chocolate is not something to take for granted, something that we should have in small amounts for special occasions, savoring every bite. So, I’m really going to make an effort to look for specific brands that are open and honest about the origin of their ingredients; this should ensure that the cocoa was farmed ethically with environmentally-friendly practices. Yes, it will be more expensive, but just like I’m budgeting my food expenses, I’ll have to budget my chocolate intake. This will cause me to appreciate chocolate a lot more, and really think about where it comes from. I am concerned about how my vegetables, fruit, meat and eggs are grown, so it should really apply to all foods I eat, chocolate included. So, how can we find “fair-trade” or slave-free cocoa products? Who can we trust? Unfortunately, “fair trade” is a buzz-phrase we hear a lot when it comes to coffee and chocolate, as well as other products like bananas amp; sugar. But just as the labels “natural” and “free range” are abused in the meat industry, “fair trade” labels are also misunderstood and abused. We cannot rely on the Fair Trade USA organization, as it’s recently been called out on their less than strict accreditation of requiring only 10% of fair-trade ingredients for a product to gain their label. The Rainforest Alliance requires only 30% of ingredients be fair-trade and IMO Fair For Life requires 50% of ingredients be fair-trade. I found an unbiased list of recommended chocolate brands on FoodIsPower.org and I’ve saved it to my iPhone so I can refer to it when I’m shopping. There are several online articles about the dark world of cocoa slavery, but their lists of recommended brands don’t always match the Food is Power list. That’s why I’d rather trust their list, as they don’t seem to be driven by labels and accreditation. They did their own research and came to their own conclusions. Unfortunately, our regular brand Green & Black (owned by Kraft) is on their “not recommended” list, even though they have been recommended by other authors writing about “fair-trade” brands. I think I always knew in my heart, I wasn’t making the best choice, but Green & Black’s lower price was so tempting. I can’t promise that every single thing I eat will be 100% ethical, but I’m willing to make a real effort for change. If we consciously make a choice to purchase chocolate and chocolate brands using ingredients that are 100% free of abusive child labor, then perhaps Hershey, Nestle, Mars and Kraft will take these matters more seriously. 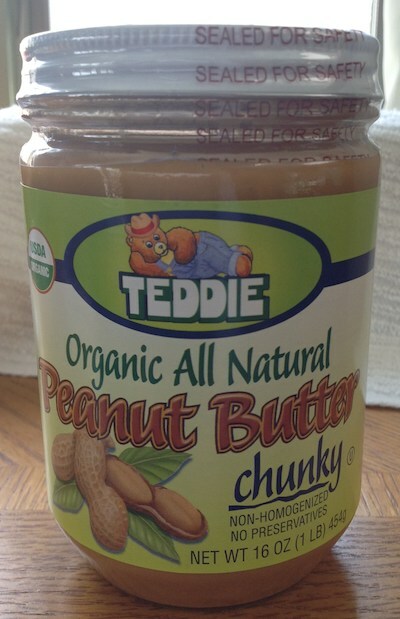 Plus, we will be supporting smaller food companies, and that is always a good thing! http://smallbites.andybellatti.com/?p=8471 – this is the article that convinced me to look more closely into the matter of cocoa slavery. FoodisPower.org – offers a list of recommended chocolate brands that are open about their ingredients, and the details behind the project. http://www.johnrobbins.info/blog/is-there-slavery-in-your-chocolate/ – great article, except that their recommended brands don’t exactly jive with the list from FoodIsPower.org, which looks to be a more comprehensive list. My blog post about dark chocolate and what the % mean. http://www1.american.edu/ted/chocolate-slave.htm – child slavery in Cote d’Ivoire (the Ivory Coast.) Includes the story of Aly Diabate, a little boy who was released from a cocoa slave farm. Author debbie @ That's Just MePosted on January 8, 2012 Categories FoodTags chocolate, dark chocolate, fair-trade chocolate, FOOD, healthy, organic, snacks, sugar, sustainabilityLeave a comment on I LOVE Chocolate! But There is a Dark Side! I found the Almost Meatless: Recipes That Are Better for Your Health and the Planet by Joy Manning & Tara Mataraza Desmond book at the local library. It is impossible to continue to feed ourselves and the world, unless we reduce our consumption of animal products. That includes local humanely raised animal products, as well as inferior cheaply-raised Big Food animal products. Eating as a “flexitarian” is so much better for your health and especially good for the environment. AND it’s good for your food budget too! We eat several meatless meals each week, but when I do cook meat, poultry or seafood, I really try hard to limit our portion to no more than 4 oz (raw) or 3 oz (cooked). It really helps to view animal products (including dairy, poultry, eggs, meat, and seafood) as an enhancement to the dish, not the main attraction. Adding more plant based foods like vegetables, fruits, grains, beans and nuts, to make those the centerpiece of home cooked recipes. And this is where the “Almost Meatless” book comes in handy for inspiration. From inside the book’s dust cover: A little meat can go a long way…. So true! Keep in mind, this is not a vegetarian cookbook, all the recipes include animal products, but they are not the main component of the dish. Meats are used sparingly, but wisely, to build layers of flavors in the recipes. The book is sectioned by each animal product (chicken, turkey, seafood, pork, beef, lamb, eggs, and broths), not by recipe subject. While browsing through the book, like I love to do, reading it cover to cover, it’s wonderful to see all the chicken recipes or all the beef recipes together, but for the home cook, it might be confusing not to be able to find one chapter for all soups, or pastas, or sandwiches, salads, or side dishes, especially when meats can sometimes be used interchangeably with each other. It might be more difficult to find what you’re looking for unless you know how the recipe is categorized in the index in the back of the book. But that is really a small price to pay for the benefits of the book. It’s packed with loads of inspiration and ideas! I especially loved the tips on making your own stocks and broths on page 130. They tell you WHY you need to use cold water and why you only want to simmer (not boil) and why you should skim the foam. Stuff I never really understood! At the beginning of each “meat” section, there is a terrific explanation. What to look for when purchasing (ie labels like “free range” which mean nothing in today’s terms), why and how to avoid the factory farmed version and find a local farm that raises their animals with care and respect. For instance, what do the terms organic or grass fed for beef mean? It’s on page 84! The “Bring Home the Bacon” blurb on page 37 was an eye-opener for me! 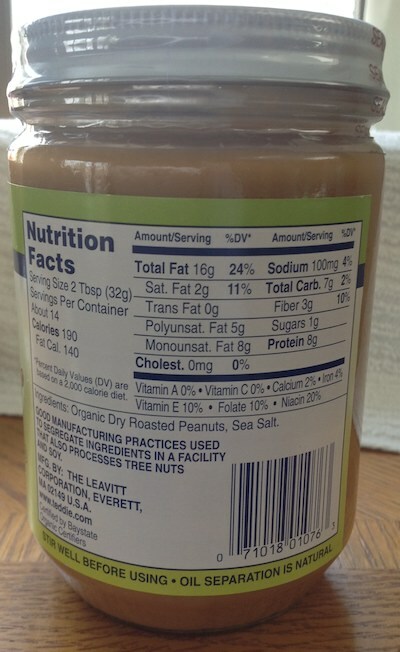 I don’t ever buy bacon (turkey or pork) from mainstream Big Food companies anymore, but if I did, I’d certainly not want to buy one that included “mechanically separated turkey” as an ingredient! There are a lot of beautifully detailed photographs in the cook book, only a few recipes do not have an accompanying photo. On the negative side, some of the photos are useless; for example, page 127 displays a yummy bowl of seeded tomatoes instead of the actual finished Pizza Strata dish. Same problem on page 95, instead of showing the finished Chimichurri Fajitas, there is a lovely eggplant photograph. Lovely yes, but not helpful for those of us cooking the dish. For the most part though, the photos do compliment the recipes, and really show great detail on what to expect for the finished recipe. One other small complaint, I wish they didn’t use so much white flour and/or white bread as ingredients. I’m NOT dead set against never using white flour or white sugar, but after all, we’re eating less meat for the health of our bodies and the planet, so give us more healthy whole grains. But I loved that they really encouraged finding local food, especially local animal products! That’s so important! 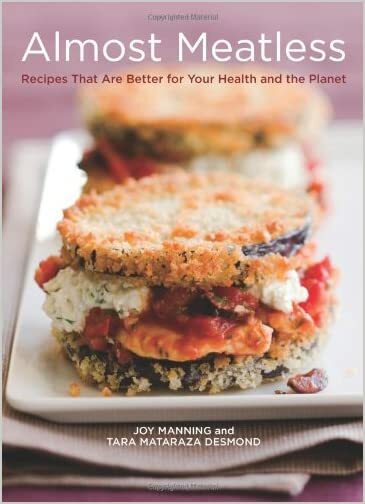 I recommend the Almost Meatless: Recipes That Are Better for Your Health and the Planet cookbook. It’s a beautiful detailed book and even the more experienced home cook will find something inspiring in the recipes as well as the tips and information. I enjoyed reading through it!